Gate Force have been Manufacturing Premium Automatic Aluminium Driveway Gates, also Gate Openers DELIVERED Australia Wide from Brisbane / Caboolture since 2004, with a proven track record in Quality and Construction on all our gates, Custom Entrance Gate Designs, Standard Gate Designs & Slat / Batten Gates, Dulux powder coating in any Colorbond Colour... Sunshine Coast | Brisbane South Side | Brisbane North Side |Brisbane Bayside | Gold Coast.. Pickup or Delivery. 40 watt solar panels are used for all solar gate openers, sliding & swing gates. Our new arrivals, the new DACE SPRINT 500 SLIDING GATE MOTOR = FAST SPEED 25M PER MINUTE = $650.00 Full DC / Electric Kit - DACE SPRINT - DACE Duraslide & Duraswing .. also proving very popular, All with a TWO YEAR WARRANTY...Made in South Africa...Sold in Brisbane Australia for the last 18 years. Gate Motors can be collected in Darra or Caboolture. What sets us apart from the others, we Fabricate driveway gates to suit the Budget and DIY, Gate Prices. We also have a great range of Gate Openers, - Low Voltage - Duraswing Solar & Electric....Gate Force Driveway Gates $160 Sq Metre = SAVE UP TO 50% DIY . Letron Remotes now available via PayPal. We also manufacture commercial / industrial gates...Need some tips Measuring up your gate opening..Visit our Gate Tips. Trade Prices are now available Direct to the Public...Call Us 1300 367 154...Moved from Acacia Ridge to the North Side of Brisbane in Caboolture, close to the Sunshine Coast, North Side Gate Frames are also a popular choice as security gates, used for the cladding of timber or colorbond sheeting...Leadtime on Gate Orders only 8 to 12 working days...Visit us to see our automatic gates & gate openers. 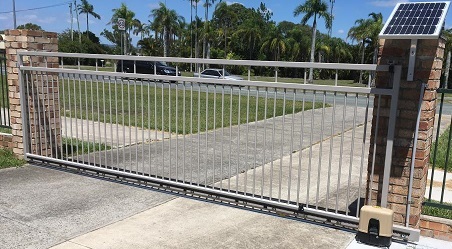 Aluminium Sliding & Swing Gates are made from 50 x 50mm box section, 100 x 50mm for sliders bottom rail with 19mm rounds, nylon bush hinges are used for swing gates, giving easy swing and adjustment to the gate, to suit driveway entry as DIY. We also have a large selection of gate hardware & gate parts in store. Aluminium Sliding Gates are made tough, with 100 x 50mm bottom rail, 50 x 50mm box section for the frame and mid rails, 19mm rounds, many DIY driveway gate designs to choose from...Powder Coated any colour. Gate frames also fabricated any size, including Sliding Slat Gates. We use 65mm x 16mm slats with 50mm x 50mm slotted frames.